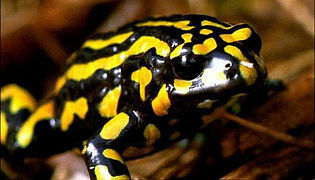 Today I want to write about one of the most beautiful and rarest frogs in the world, the southern corroboree frog. These brightly coloured frogs only grow about 3 cm long. They get their name from the aboriginal word for a gathering where people paint their faces with bright colours. They eat ants, mites and other very small invertebrates. At breeding time, southern corroboree frogs only lay about 16-38 eggs. The eggs develop to a certain stage and then pause until the autumn or winter rains come and the little tadpoles hatch. These guys look cute, but they are brightly coloured for a reason. They were the first vertebrate that was discovered to create their own toxic poison. Other frogs get their poison from the food that they eat. Southern corroboree frogs live at high altitudes and their entire population lives within the Mt Kosciosko National Park in New South Wales where they are found in sphagnum moss. They are critically endangered due to disease, habitat loss and droughts. There are only about 200 left in the wild. Are there any other interesting facts that you would like to share about southern corroboree frogs?